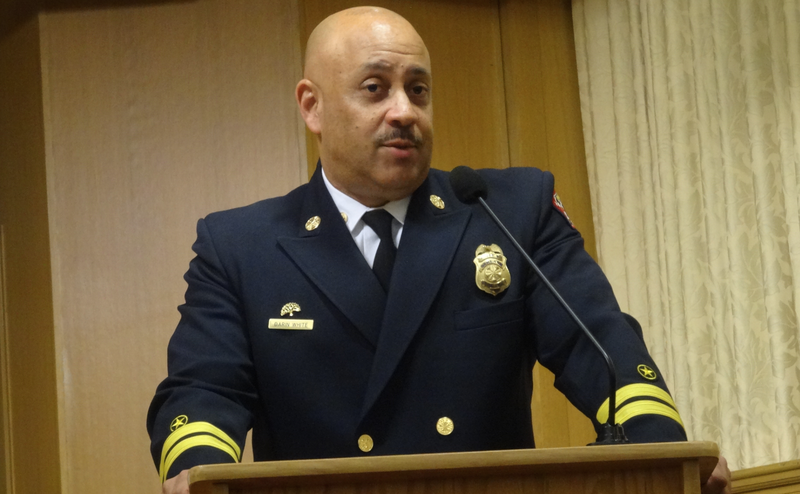 Oakland's new Fire Chief Darin White said last night at a League of Women Voters event that his department needs more staff. It's the top item on his "wish list" of needs. "For a long time, the department has been understaffed," he bluntly told an audience of about two dozen Oakland residents. White's observation is underscored by a recent city report showing that 50 crucial positions in the fire department are currently vacant, despite being funded. This includes 11 missing captains, eight lieutenants, three paramedics, 12 firefighters, three dispatchers, and multiple other jobs critical to public safety. Following the deadly Ghost Ship and San Pablo Avenue fires, the city council and mayor also committed to hiring more fire inspectors. Six new fire inspector positions were included in the 2017-18 fiscal year budget approved in June, but so far, only one of these positions has been filled. And the department is still missing an assistant fire marshal. Asked about what's changed after the deadly Ghost Ship fire, White declined to share specifics. But he said the department has moved to improve communication between its inspectors and the planning and building department's employees. The chief also acknowledged that the department's systems of inspecting vegetation and other fire hazards in the tinderbox Oakland hills has been flawed, and that he hopes to modernize the tools used by Oakland fire personnel to help homeowners remain in compliance. He also said fires at homeless camps are "on the rise," but didn't have much to say about how the city intends to improve safety for the roughly 1,900 unsheltered people who live on the streets. Overall, White said he will focus on keeping the community safe while also ensuring the safety of his employees, and looking to implement new technology to improve efficiency.